Listening to the brain to understand hand-eye coordination. The only thing that’s visible in the dark room is a rectangle, chartreuse and glowing, in the middle of a screen. The image vanishes. Milliseconds later, it pops up in the upper right corner of the screen. A pair of eyes follows, glancing, drawn to the image, and a hand reaches to touch it. Boop. The tone signals that another trial has been successfully completed. Jug, the subject, is a consummate professional, focused and quiet. Boop, boop, boop. The sound rings out ten, twenty times a minute. Outside the copper doors – copper to block out radio waves that pass through the air – the laboratory hums with activity. Floor to ceiling computers, video monitors, fluorescent lights, monkey social coos, and the banter of researchers all contribute to the mix. One computer screen replicates what Jug sees, with the addition of a cherry-red dot that tracks his eye movement as he glances at the green rectangles. A grey video image of Jug shows how his left arm moves to touch the rectangle on his screen. Boop. “Here, listen to this,” says Heather Dean, a researcher at NYU’s Center for Neural Science, as she hands over a pair of massive headphones. Static erupts through the earpiece as it transmits the crackle of a firing neuron when the monkey moves his eyes and hands. We are listening to the brain at work. The sounds of Jug’s brain are being recorded in a new laboratory that’s under the direction of Bijan Pesaran, a neuroscientist and Dean’s supervisor. Pesaran couples the hand and eye movement data with brain recordings to study neural connections between different parts of the brain. What is unusual about Pesaran’s data is that he not only records the firing of single neurons – the loud crackle we hear through the headphones – but also the continuous, low hum that’s heard in the background. That hum, referred to by neuroscientists as local field potential, stems from the weak electrical impulses created by many synchronized neurons surrounding the neuron in question. Research on specific brain networks and their local field potentials helps neuroscientists understand the brain’s complex wiring. Their research could help develop more sophisticated neural prosthetics for patients with limited mobility, such as paraplegics. The brain cells that Pesaran studies are found in a fold of the parietal cortex, the grey matter above and behind the ear. 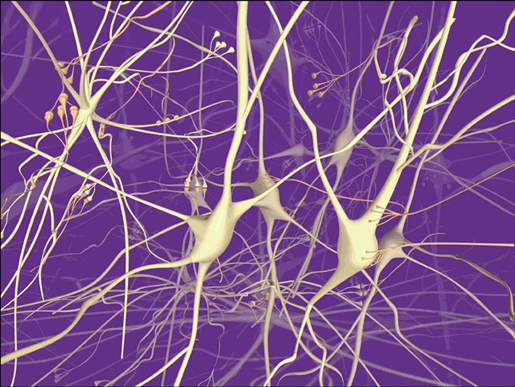 These neurons are tied to very specific hand or eye movements. For example, when a monkey like Jug looks to the right, visual neurons in the parietal cortex associated with glancing to the right fire, but those associated with glancing to the left do not. And unlike neurons in the motor cortex that simply stimulate muscles to contract, parietal neurons play a role in planning movement. Hands and eyes move both individually and in coordination with each other. But until now, neuroscientists specialized on specific parts of the brain and focused on how the brain controls the movement of one area at a time. “Amazingly few studies have brought them together,” Pesaran says. In the past, technical problems made recording from two parts of the brain difficult, even when areas were close together. Having solved these logistical issues thanks to his previous work with Richard Andersen, a neuroscientist at the California Institute of Technology, Pesaran now has proven that the hand and eye often move in relation to each other. “Behaviorally, they are coupled,” he states. “When the monkey is reaching to touch a certain location in space, it doesn’t really matter where he was reaching from, it really only matters where he is looking as he reaches,” says Pesaran. Over many months, Pesaran and Dean trained a monkey not to move his eyes while moving his hand. This is no mean feat – try reaching for a cup of coffee without looking and it becomes obvious how connected glancing and hand movements are. Once the animal was fully trained, the neural connections associated with hand-eye coordination were no longer detectable. These results not only demonstrate how two different parts of the brain are coupled but also show how flexible brains are by quickly re-wiring to new demands. Pesaran and his colleagues faced an uphill struggle to get others to accept this finding. “It took us a long time to publish the result,” he recalls. “When people don’t expect your results, you have problems.” The results appeared in the 5th issue of Nature Neuroscience in 2002. Around the same time Robert Desimone, then at the National Institutes of Mental Health also demonstrated the utility of recording the local field potential in a region of brain that’s associated with attention disorders. Andersen and Pesaran’s research on local field potential may also lead to more efficient neural prosthetics. Researchers at Brown University recently figured out a way to control prosthetic devices with single neurons, but when scar tissue surrounds the implant, it can prevent the brain signals from transferring to the device. Andersen and Pesaran hope to ameliorate this problem by creating prosthetics that detect local field potentials from a much larger portion of the brain. The implants could last longer and require fewer surgeries since the interface uses the hum of multiple neurons instead of the signal of one. Andersen’s lab is also exploring movable electrodes that could further revolutionize prosthetics because recording brain signals can be continually optimized. “To control an artificial arm by recording local field potential over a long period of time is more feasible than single neuron,” says Desimone. More flexible and sophisticated prosthetics could be created by recording from the parietal area of the brain, the region associated with planning and abstract thoughts. Pesaran’s goal is to help paralyzed individuals “tap into those signals and in effect open a door within the brain to let you communicate or control external devices.” Currently, he holds a patent for such a prosthetic that harnesses local field potentials in the parietal portion of the brain. In the lab’s common room, an espresso machine hums steadily as pressurized water passes through the filter, absorbing the rich flavor of coffee. Pesaran is meticulously creating the perfect cappuccino with his laboratory’s high-end machine. He discusses the future of his research: it is early days for work applying local field potential to parts of the brain that share a common network. It may take months, if not years, before enough trials lead to the practical applications of neural prosthetics. In the meantime, Jug diligently finishes another trial with Heather Dean observing in the room next door. See how an NYU chemistry lab uses nanotechnology to improve bioimaging. An NYU professor works on delivering drugs to the brain. And read how non-human primates can help biologists understand human disease.